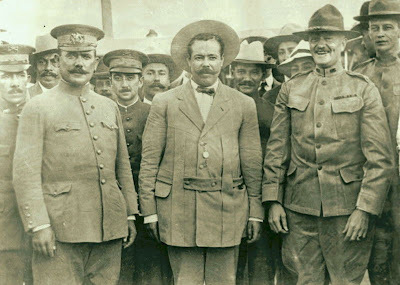 General Pancho Villa in Mexico City in 1914. "Riding with Pancho Villa," a new photography exhibit, has just opened in Abilene, Texas, celebrating the centennial of the Mexican Revolution, and held in conjunction with events honoring the founding of the Republic of Texas (1836-46). Included in this celebration is an exhibit of over 40 rare historical photographs brought to the US by the legendary "outlaw," Francisco "Pancho" Villa's 25-year-old great-grandson, Francisco Villa. It was no simple task to bring these photos to the US from Villa the younger's native Mexico. Due to Mexico's stringent policy regarding protection of it's cultural heritage and artifacts, Villa was required to submit documents signed by authorized US experts guaranteeing that the images were not being imported for sale, but only for temporary exhibit purposes. Fortunately, Villa, being a political science student at Abilene Christian University, was able to secure letters to this effect from the university's Office of Multicultural Enrichment. And the photos made it across the border and into Texas without a hitch. Discusses Exhibit With Frontier Texas! Executive Director Jeff Salmon. Francisco Villa's father, Agustin Villa, had been exhibiting these photos in Mexico City at various museums and other select repositories in his country for the past several years. 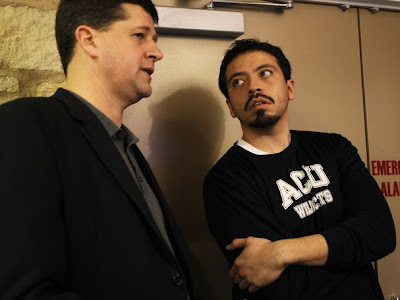 A decade ago, Francisco began attending school in the Dallas/Fort Worth area. "At some point we decided that since I was going to be here it was a good idea to bring [the photos] to the U.S." for what would be a first-time domestic exhibition. 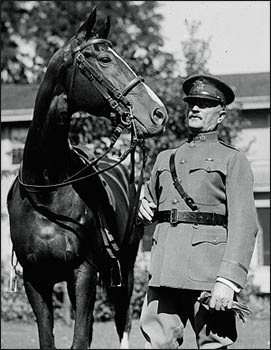 General John Joseph Pershing With Horse, 1920. Fateful Meeting at meeting at Ft Bliss, Tx, 1914. (George S. Patton, Jr., Directly behind Pershing). On The Wrong Side of the Gun: Villa Ambushed, July 20, 1923. The exhibit, is comprised of photos acquired from the Casasola Archives, widely acclaimed as the most richly detailed collection of images documenting Mexico's history in the early 20th century. 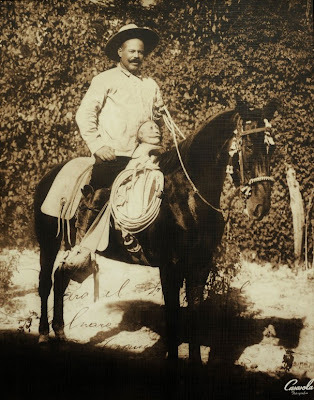 Agustín Casasola (1874-1928), was a photographer and author who created Mexico's first press agency in 1911, and in 1917 published the famous Album histórico gráfico, which was intended to be a complete photographic record of the Mexican Revolution. (Unfortunately only the first six volumes, covering 1910-1912, were actually published.) The Casasola collection, well over 500,000 prints and negatives, is now housed at the Casasola Archives at the Instituto Nacional de Antropología e Historia. Of all the photographs, the one most treasured by Francisco is an image of Pancho Villa surrendering after a bloody ten-year campaign against the Mexican government. He says, "You can see in his face that he is not tired, he understands he must go through another way. You can tell [his soldiers] are burned from the desert, they are all dirty." Pancho Villa And Soldiers Sign Act of Surrender, July 28, 1920. Captions for the Frontier Texas! exhibit are, appropriately, bilingual with text in both English and Spanish, each accompanied with a quote from one of Villa's biographies. Jeff Salmon, executive director of Frontier Texas!, says of this exhibit: "it allows us to show a piece of history that deserves discussion. Although Villa is a controversial figure to many - it was a very important time in history. The photos are a fascinating look at a particular time and place in history." Also highlighted in the exhibit are documents relating to the bicentennial of Diez y Seis de Septiembre (Sept. 16, 1810), when Mexico won its freedom from Spain. The exhibit continues at Frontier Texas until May 28, 2010. Other activities in this celebration are listed on the Frontier Texas! homepage. If successful, Francisco Villa and his family hope to take the exhibit on tour across Texas and the US. Pancho Villa had at least 23 children with various wives, so more great-grandchildren are bound to turn up somewhere on the exhibit's ride.